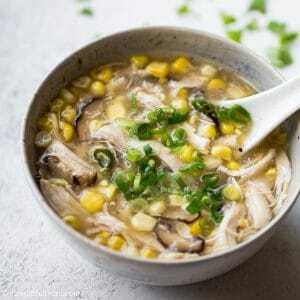 This easy chicken corn soup with shiitake mushrooms is a popular Vietnamese soup. It has the natural sweetness from fresh sweet corn and earthiness from dried shiitake mushrooms. You only need half an hour to cook a large batch in a pressure cooker such as an Instant Pot. pressure cooker very often in summer. It reduces cooking time significantly, and it doesn’t heat up the kitchen. It is definitely one of my favorite tools in the kitchen. 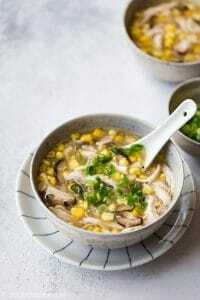 I made a large batch of this Vietnamese chicken corn soup in my Instant Pot last week and ate it for lunch for a few days. So easy and convenient! 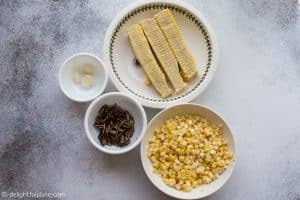 Give this recipe a try if you have more sweet corn than you know what to do with it this summer :). 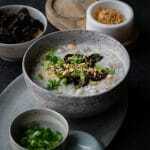 Chicken corn soup with shiitake mushrooms is a pretty popular soup in Vietnam. The name in Vietnamese is “sup ngo ga nam”. There are some other variations where they also add cubed carrots and egg whites to the soup. You can customize this soup to your liking by adding your favorite vegetables. 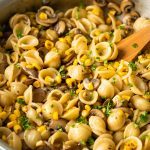 I like to use just sweet corn, chicken, and mushrooms. Either chicken breast or chicken thigh works perfectly. The cooking method is straightforward and cannot be easier. You just need to throw all ingredients into the pressure cooker and cook on High pressure for 5 minutes. Once the pressure cooking period is over, shred the chicken and add some cornstarch slurry to thicken the soup. Add some black pepper, scallions, and cilantro to each serving bowl and enjoy. I feel like I don’t need to write up a recipe card since it is so easy :). Put dried shiitake mushrooms in a bowl and pour boiling water into the bowl to cover the mushrooms. Set aside for about 5 minutes to let them rehydrate. 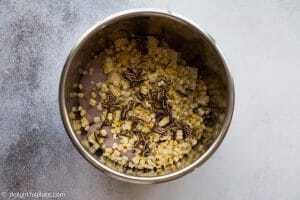 Separate corn kernels from the cobs. Once the dried shiitake mushrooms are soft and plump, remove them from the liquid and slice the mushroom caps thinly. 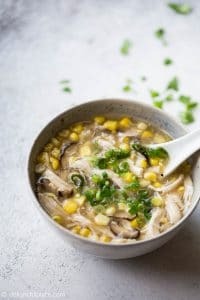 Add all ingredients: corn kernels, cobs, chicken breasts, shiitake mushrooms, garlic, chicken stock, 2 1/2 cups of water and salt to the Instant Pot. Set the Instant Pot to Soup function (don't forget to seal the valve) and cook for 5 minutes on High if releasing pressure naturally, or 6 minutes if using quick release. Discard the corn cobs. 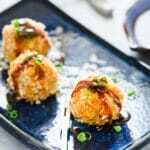 Take the chicken breasts out of the pressure cooker, shred and return to the pressure cooker. Mix the cornstarch and water to make the cornstarch slurry. Set the Instant Pot to Sauté mode, and when the soup starts to simmer, slowly add the cornstarch slurry and stir to let the soup thicken to your liking. Add fish sauce (more or less to taste) and plenty of black pepper. Divide into serving bowls, top with scallions and cilantro and serve hot.